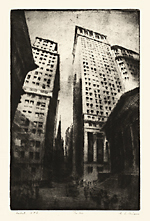 Wall Street, N.Y.C.- - c.1930, Etching. Edition 100. Signed, titled and numbered 100/78 in pencil. Image size 13 15/16 x 8 15/16 inches (354 x 227 mm); sheet size 17 7/8 x 11 1/2 inches (454 x 292 mm). A superb, richly inked impression, on cream laid paper, with full margins (1 1/4 to 2 1/4 inches), in excellent condition. Printed by the artist. 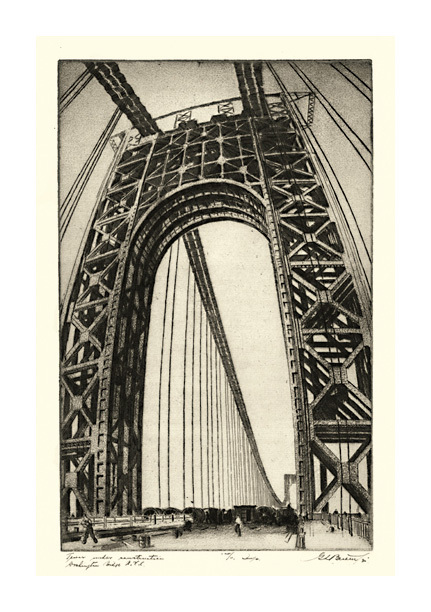 Tower Under Construction, George Washington Bridge, N.Y.C.- - 1930, Etching. Edition 100. Signed, dated, titled and annotated 100/11 Imp. in pencil. Image size 14 3/4 x 9 5/16 inches (375 x 237 mm); sheet size 18 1/8 x 12 3/4 inches (460 x 324 mm). A superb, richly inked impression, on cream laid paper, with full margins (1 1/4 to 2 inches), in excellent condition. 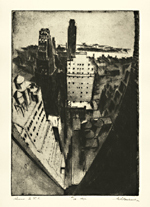 Printed by the artist. 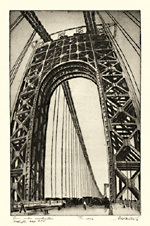 Selected for Fine Prints of 1933. 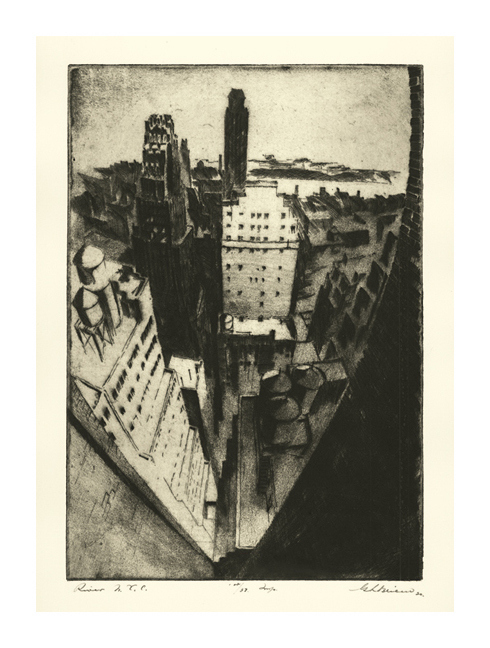 River, N.Y.C.- - 1930, Etching. Edition 100. Signed, dated, titled and numbered 100/37 in pencil. Image size 13 3/4 x 9 3/8 inches (349 x 238 mm); sheet size 18 1/8 x 13 1/8 inches (460 x 333 mm). A superb, richly inked impression, on cream wove paper, with full margins (1 3/8 to 2 7/8 inches), in excellent condition. 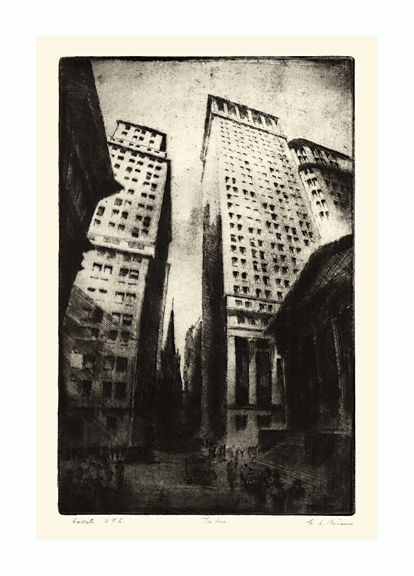 Printed by the artist.